The Jumpshare Blog - Page 5 of 11 - Re-imagining the way people upload, share and interact with their files. 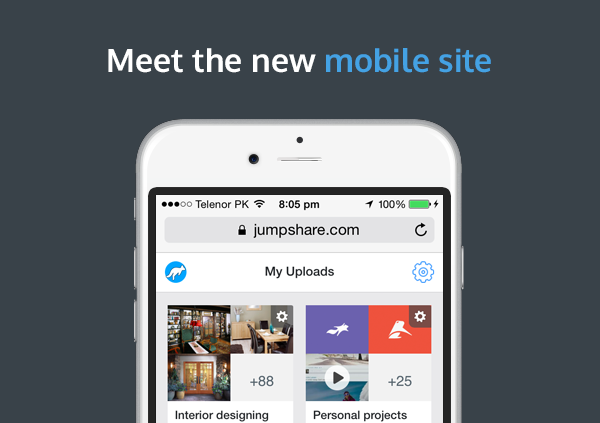 The Jumpshare Blog What is Jumpshare? As part of our workflow, sometimes we want to receive files from our customers, clients, contractors, etc quickly without asking them to sign up for an account to our preferred file sharing service. Where our goal at Jumpshare is to make file sharing as easy as possible for our users, receiving files from others is also something we want to simplify. After many months of brainstorming and development, we’re happy to introduce Jumpshare Inbox, a permanent solution to this very problem. Once set up, you’re given a unique personalized link which you can share with anyone to receive files instantly in your Inbox. It’s as easy as the name suggests. 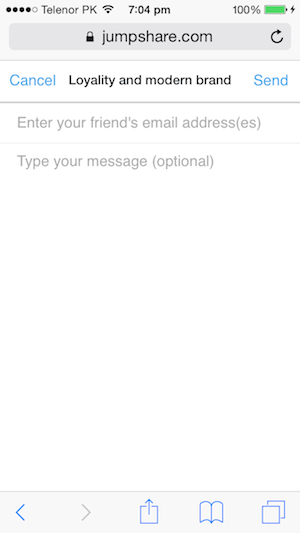 Visit the Settings page and you will find a new section called “Inbox”. Take your time to set it up by giving your Inbox a unique name, which will become the vanity URL. Once done, you will be given a unique personalized URL based on the name you choose for your Inbox. Now just share this link with anyone to instantly receive files in your Inbox. We’ve made the Inbox link such that it’s easy to memorize. 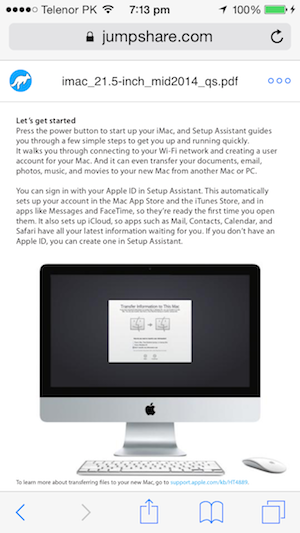 The recipient has to write his/her name and email, add files and just hit Send. It’s that easy! The recipient also has the option to write a subject or a message, both of which are optional. There is no limit to the number of files you can receive, nor is there any file size limit. All received files go in your Inbox. To access the files, go to the “Shared” tab and you will find them listed on the “Shared with me” page. You can view files, download them, or save them to your account for permanent safekeeping. Inbox is going to be a lifesaver for those whose work depends on receiving files from their customers on a daily basis. Let us know what you think about this feature. 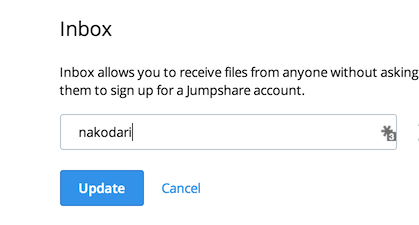 Jumpshare Inbox is available to all Plus users. Happy Receiving! We all share links on a regular basis, just like we share files. Sometimes we want to showcase our work, share our favorite videos, or just share the latest news with friends. 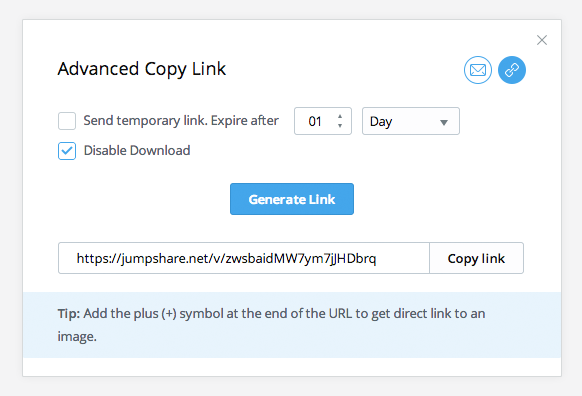 We’re happy to announce that, starting today, you can share your favorite links using Jumpshare just as easily as you can share your files. 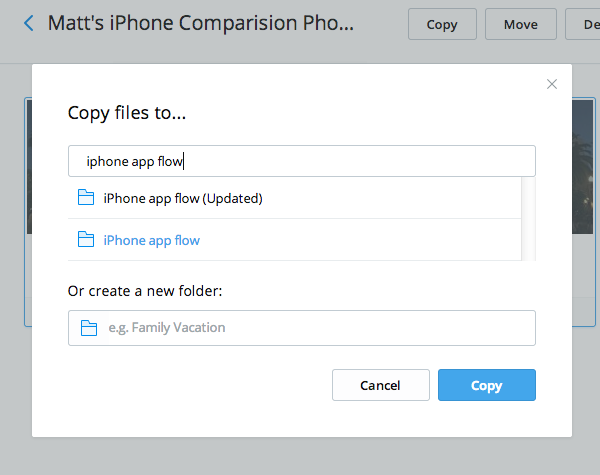 Now both file and link management can be done from one place; Jumpshare. You can curate your links around a theme (a nice way to organize your bookmarks), for e.g., saving links for your perfect vacation, recipes for your favorite dishes, and more. You can know how your links are performing by checking how many views it got. If you’re a Plus user, you can track even more data using Analytics, such as, which countries visitors came from, their browsers and operating systems, and their screen resolutions. 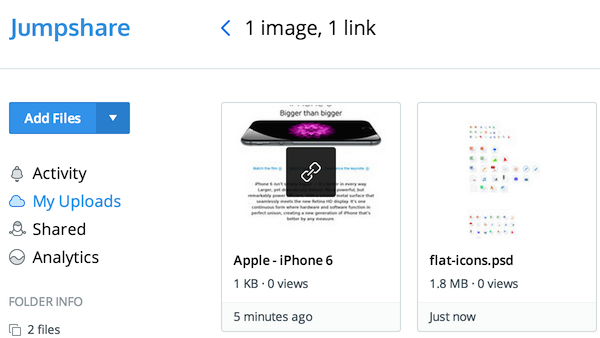 Since preview of the link is shown in the file viewer, you can mix your links with other content while giving a presentation and open your links in style during your pitch or a conference. You can share links from both the desktop apps and the web interface. To share a link from the web interface, click the drop down arrow next to the Upload button and select “Upload Link”. In the pop-up box, paste the link that you want to upload and it will appear in your account instantly, ready to be shared! Click the link to open it in the viewer. You will see a screenshot of the page whose link you uploaded. Clicking on the “View Original” button or anywhere on the screenshot will take users to the destination in a new tab. 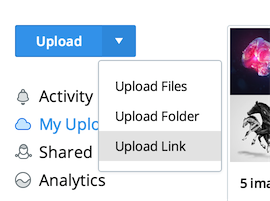 Apart from uploading links, you can also use this option to upload files via a direct URL. Just paste a direct URL to a file and we will automatically fetch it from the server and upload it to your account in seconds. So the next time you come across any file on the internet, instead of downloading it to your computer and then uploading it to Jumpshare, just use the link uploading option to directly upload the file to your Jumpshare account. 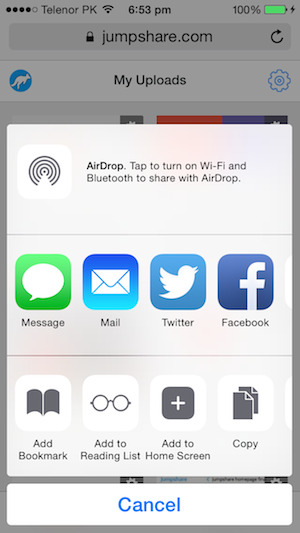 Link sharing works on both Windows and Mac apps right out of the box. Just copy a URL to your clipboard and use “Upload via Clipboard” option (Control+Alt+U hotkey, can be customized) to quickly upload a link, ready to be shared. 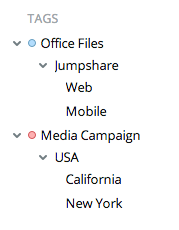 What makes link sharing on Jumpshare better is that you can get all the options that are available when you share files. For example, you can send a link via email, with an option to expire after a certain number of views or days, set a link to self-destruct automatically (which will remove it from your account), or lock it with a password before sharing (useful when sharing private work that’s not ready for public). Better yet, you can track performance of your links and get insights into your visitors using Analytics. 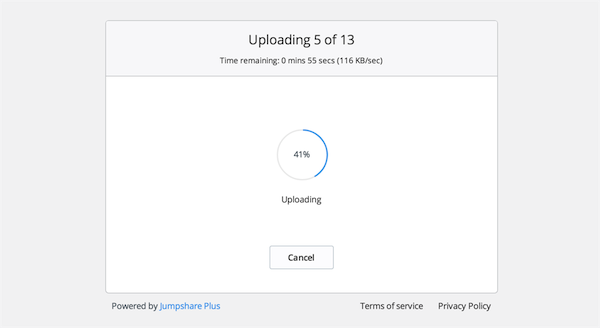 At Jumpshare we strive to provide the best file sharing experience, and we know that fast and easy sharing is only half of it. The other half is knowing how well your files are performing and gaining insights into your audience. 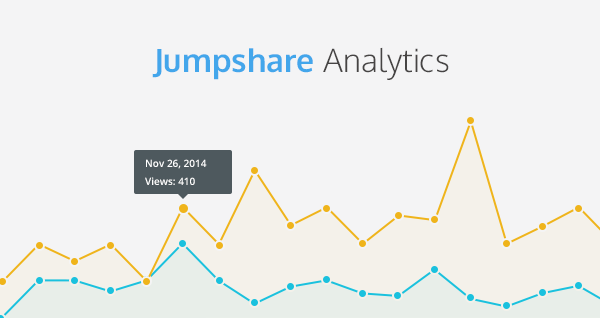 Today, we’re excited to launch Analytics for Jumpshare Plus. Analytics help you analyze how your files are performing and gives you a comprehensive overview of your audience detailing who’s viewed and downloaded your files. 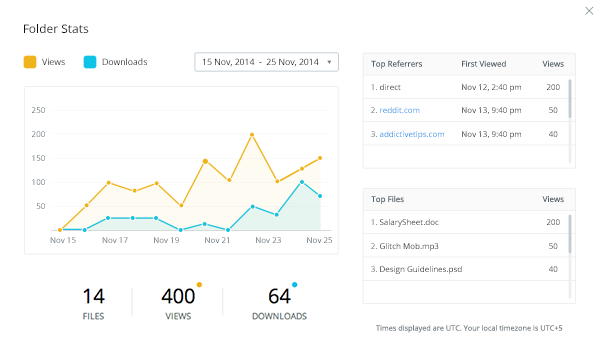 An actionable dashboard of top files, top referrers, total views and downloads always keeps you in the loop. 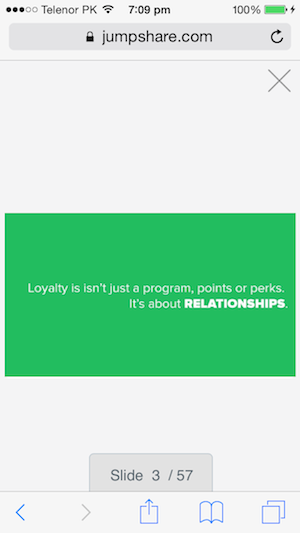 Use Analytics to gain valuable insight into your audience to grow your business. Know which countries your visitors come from, which web browsers and operating systems they use, and what screen resolutions the files are being viewed on. If you’re looking to quickly view data for a recently shared folder or file, just right-click it and select “View Stats” to open a pop-up box where you can take a quick glance of how’s it performing. Since Analytics is a new feature, file stats from before will not be available however starting today, all visits to your files will be tracked. Over the next few days, your Analytics page will start populating with data, depending on how many visitors view your files. We’re happy to be the first file sharing service to bring Advanced Analytics to individuals and small businesses at a simple, affordable price with Jumpshare Plus (at just $9.99/month). It’s simple, fast and easy to use! P.S. Analytics is only available on the web app. The next update will bring Analytics to the desktop apps. The upcoming iPhone app will also have the Analytics tab built-in. We can’t wait to release them. Happy sharing! We know how important it is to access, share, and view your files on the go. Today, we’re launching a brand new mobile website with a revamped interface, quick sharing options, and a new file viewer that allows seamless previewing of over 200 file formats online. With the new file viewer, users can easily switch between different files inside their folder. 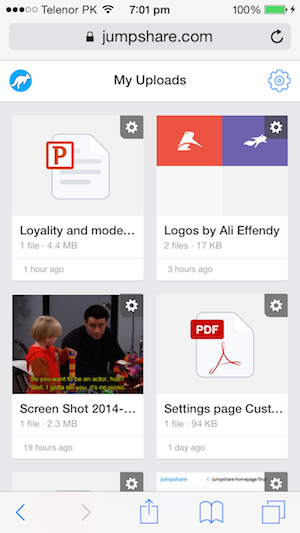 If you’re a Jumpshare Plus user, your custom branding will remain intact when sharing files. Viewing presentations, spreadsheets, documents, video, audio, or large photo albums just became a lot better now. We’ve made sure everything, including fonts, code, eBooks, CAD files and other files can be previewed on the smartphones. Once you’re logged in, you will see your recent uploads. Click any folder to view the files inside, or click the cog wheel on each thumb to view folder options, such as, Copy Link, Share, Delete, Download, and Cancel. Copy Link shows you the link in a pop-up from where you can copy and share it. To quickly share your files via email, click Share, enter recipients’ email addresses, type a message (optional) and hit Send. Click any file to open the file viewer. Swipe left to view the next file and swipe right to view the previous file. The counter at the bottom of the viewer will show which file you’re viewing currently. For files, such as, presentations and spreadsheets, you can browse them in full-screen mode. Inside a presentation, you can swipe left and right to view the next and previous slides, respectively. Click X to exit the full-screen mode and return to the file viewer. Similarly, you can tap View to preview the spreadsheet in full-screen mode where you can browse and switch sheets easily. 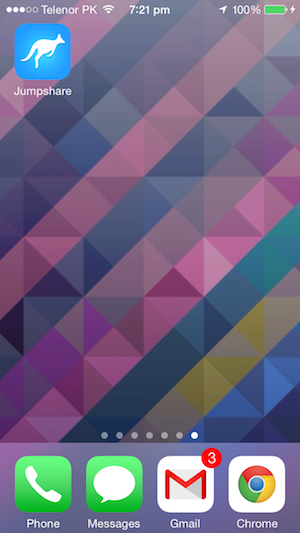 Videos and Audio files play using the default OS players when you tap on them. From the Settings page, you can change your Account Settings, such as, your name, email, and password and switch between the Light and Dark viewer. You can add the Jumpshare mobile site bookmark to your home screen to quickly access it until the official app becomes available for your phone. Both our iPhone and Android apps are under development. The iPhone app is scheduled to launch next month. 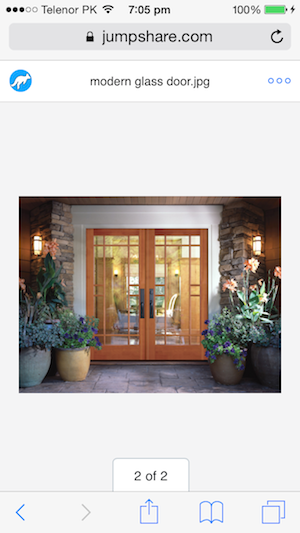 To add a bookmark to your home screen, visit jumpshare.com on your phone and tap the Share button. From the list of options, select “Add to home screen”. We believe the new mobile site will help you easily access and share your files while on the go. The ease of sharing extends to benefit your recipients who will be able to preview the files you share with them, on any smartphone or tablet they may be using. The ability to share preview-only links (where download is disabled) and temporary links (that expire after a certain number of days, views and downloads), were only available when you were sending files via email to friends or clients. 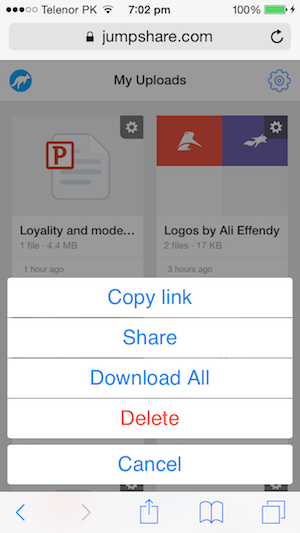 Many of you want to share files quickly on blogs, forums, IM, etc, and wanted advanced sharing options for Copy Link. Today, we’re introducing Advanced Copy Link tab in the Share box. To access advanced copy link options, right click any file or folder and select Share. From the Share box, click on the new “Advanced Copy Link” tab. By default, your normal copy link URL is shown, choose advanced options and click “Generate” to generate a new URL having advanced options. You can choose different advanced options at any time and click Generate to generate a new URL, there is no limit to how many times you can generate a new URL. Advanced Copy Link tab will be available on the desktop apps in the next release. At the moment, you can access it from the Share box on the Web app. Tags give you a way to organize all your shares (folders) by projects, companies, clients, customers, etc. It’s a quick way to organize your work so you can find it later. However one level tags can be troublesome if you have too many folders to organize. We do not support nested folders because we want to keep file sharing dead-simple and easy, however for advanced users who would like to organize their work, we now support nested tags up to 3 levels. All tags appear in the sidebar of My Uploads page. Nested tags are useful if you have multiple projects to work on for a single client, company, etc. Creating a nested tag is similar to creating a new tag. Click “New Tag” from the left sidebar and you will find “Nest tag under:” option in the pop-up box. 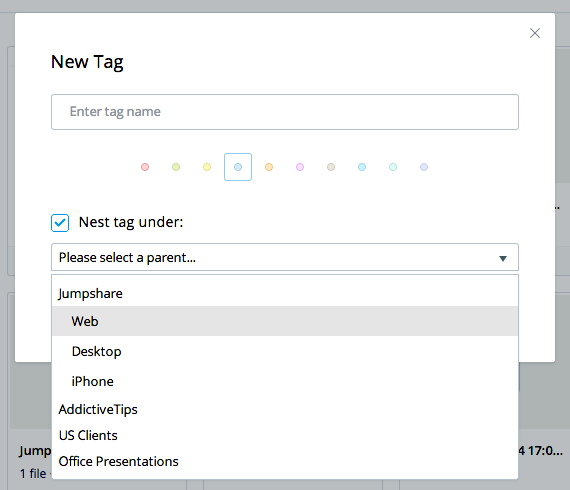 Check this option and select a parent tag under which you want to nest the new tag. When done, click Create. Once the newly created nested tag is ready, select folders to add the tag to and click “Tag” button in the header to tag them all. It’s that easy! 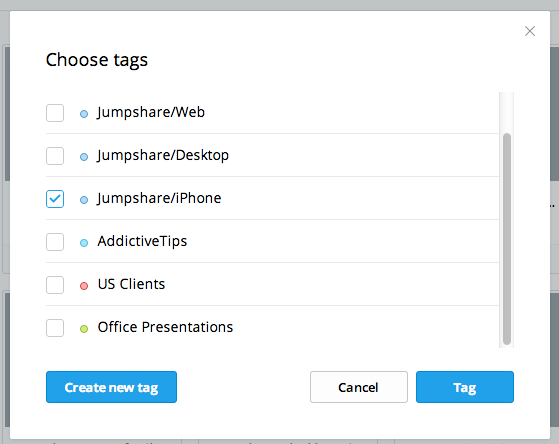 At Jumpshare, we use nested tags to organize our work and personal files. We believe nested tags will become an integral part of the workflow for our users and make it easy to organize your files better. Almost everyone uses search to quickly locate their files. The faster search works, the happier everyone is. We’re worked to make search even faster at Jumpshare. Today, we’re announcing two new additions to Jumpshare; real-time search and the ability to quickly search for your folder when copying, moving, or saving your files. To search for your files, just start typing in the search bar and the results will appear in real-time. You can modify the keywords and it will reflect in the search result automatically. We believe real-time search makes it easier for users to locate their files and folders because it doesn’t require users to type and press the Enter key over and over again. When copying, moving, or saving the files, you will see a new search bar on top of your folders in the pop-up box. This will help you quickly filter the folder where you want to copy, move, or save your files. Just type the folder name and the result will reflect automatically, in real-time. There are many more improvements and features coming to Jumpshare in the coming days. We’ll keep you updated. Happy sharing! 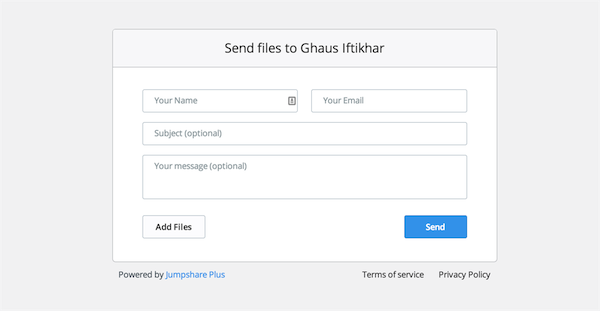 We launched Jumpshare Plus to make sharing large files easier. As the world moves to 4K videos and High Resolution RAW images, many of you told us that 100GB is not enough space to store all the important stuff. So starting today, we’re offering 10x more space to Jumpshare Plus users. 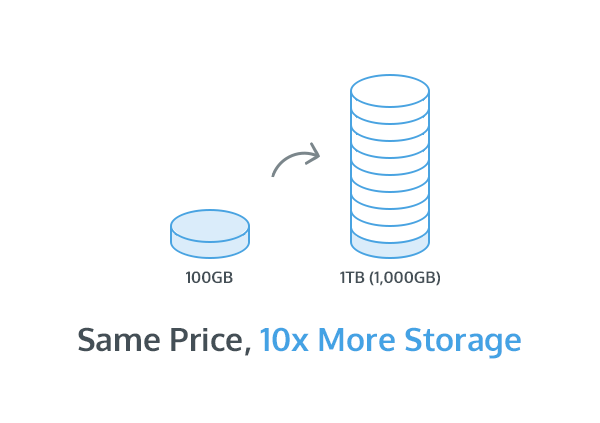 We’re excited to announce that all Plus users will now get 1 Terabyte storage (1,000 GB). This is a big jump and with many new features in the pipeline, we want to ensure that you have enough space for your files so you can get the most out of Jumpshare. Jumpshare is the world’s fastest visual sharing platform to help creatives share their work, view over 200 file formats online, and collaborate with team and clients. Work better starting today - it’s free!